Researchers at Duke University in North Carolina (US) have created a new technique to make hybrid thin-film materials. The study could provide an avenue to scale-up hybrid perovskite thin-film deposition for solar cells and also pave the way to new light-emitting diodes and photodetectors. Methylammonium lead iodide (MAPbI3) is the perovskite most commonly used in solar technologies and one of the few perovskites that can be fabricated with standard production techniques. And yet, the solar industry needs innovative production techniques to overcome the significant challenges that still remain in making these organic-inorganic thin-film materials. The delicate organic elements are critical to the hybrid material’s ability to absorb and emit light effectively. MAPbI3 at least has a very simple organic component — but is an excellent light absorber. The goal is to build more complex molecular combinations to enable better materials. Duke’s new approach to making hybrid perovskites could be a huge leap in that direction. The new technique could be a game-changer for perovskites. “RIR-MAPLE will help hybrid perovskites mature into a general class of crystalline organic-inorganic semiconductors by providing thin-film synthesis of perovskite heterostructures, regardless of solubility,” says Stiff-Roberts. What is more, RIR-MAPLE offers major advantages, compared with previous techniques. 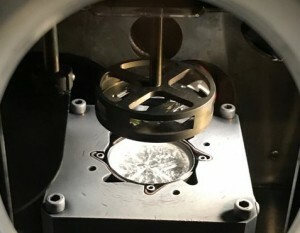 “Contrary to other approaches for physical vapor deposition of hybrid perovskites, RIR-MAPLE can deposit stoichiometric films without an excess of the organic component in the target,” notes the professor. “This control over the organic molecule deposition rate enables the compositional control required for gradient or layered structures.” Thus, the study could have notable impact on the design of the next generation of solar cells. “By demonstrating that RIR-MAPLE is capable of producing hybrid perovskite solar cells with material quality and device performance comparable to other deposition techniques, our study provides an avenue to scale-up hybrid perovskite thin-film deposition for solar cells,” the expert confirms. The professor says her next steps in this research are to better understand the formation of hybrid perovskite crystals during RIR-MAPLE deposition and to characterize material properties of hybrid perovskites comprising more complex organic molecules.